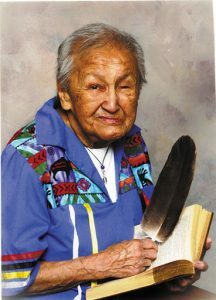 On March 31, 2019 Ogichidaa Kavanaugh received the sad news of the passing of Elder Nancy Morrison. “Nancy was a tireless advocate on behalf of the Anishinaabe citizens, sharing her guidance and strength to others. She assisted Anishinaabe organizations and other agencies by providing spiritual support to the meetings and helping all those who asked her.” stated Ogichidaa Kavanaugh. Nancy mentored and was a role model to many in her life. Her biography, Approaching Dawn shared her life story of being at residential school, facing racism and her history of gentle activism and advocacy. We send our thoughts and prayers to her children – Don, Patty and Bill, to her brother Fred and all her extended family during their time of loss.